Yesterday was American Thanksgiving, and I got invited to a travelers' get-together organized by a couple American girls from another hostel. The girl that invited me is British, and is staying at the same guesthouse I am, and only randomly met one of these other girls by chance. She wanted to take part and asked me if I'd like to go. This is how the world of backpackers social lives works! In the end there were about 10-12 of us, and I think only 3 were American! There were several other Canadians (Hello, Canmore AB! ), a bunch of Europeans. We met at the Central Market and then went a local restaurant which fed us a DELICIOUS all-you-can-eat dinner of assemble-your-own rice wraps with greens, BBQed pork, egg omelets, spring rolls, and mouthwatering peanut sauce. I was a happy, happy camper. The best part, though, was the massive collection of strangers (most people only knew one other person at the beginning of the meal) who all sat down together and enjoyed each others company for several hours! Traveling really brings people together....its funny how you can just have that one thing in common, and soon you feel like you've been friends forever! 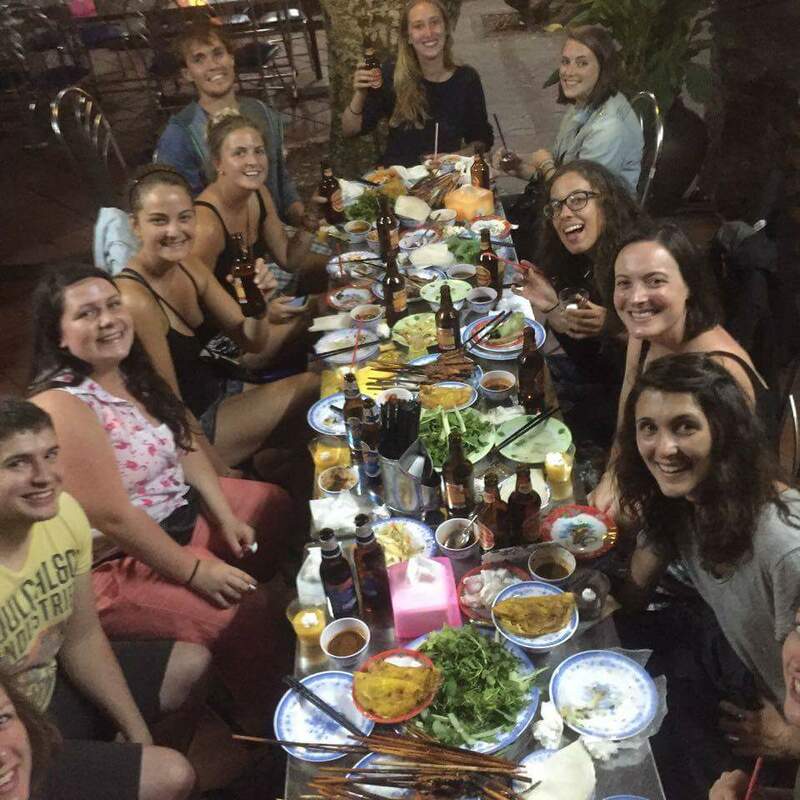 I have been enjoying my new British friend's company since my first evening in Hoi An (we spent all day together yesterday), and I met another girl at this dinner from California who was really cool, and the three of us just got along so well- what a treat! I get such a boost when I find friends along the way, because I actually don't usually like hanging out by myself!! As per Thanksgiving tradition, we went around the table saying something we were thankful for. Health, safety, and new travel friends featured heavily, and I too am thankful for these things. But for myself, I said I was thankful for being lucky enough to have the opportunity to travel. Having met so many local women my age has made me aware of the privileges of my circumstances. Having been born into the advantages that are innate to being a middle-class Canadian have enabled me to be financially independent, and enabled me to travel in so many more subtle ways (different expectations of women, education, opportunity, independence, even support and encouragement from peers, etc). Many women around the world do not have these priviledges. I spoke with a tailor yesterday who is my age...she learned the trade from her mother and has worked since age 18, long hours, no days off, and she is also raising a family. She has never had the opportunity or means to travel, and probably never will. Your friendsgiving sounds like the bestest of times! Peanut sauce...my mouth is watering! I`m excited to hear more as this dream continues to take shape.